One of my favorite Fall soups is potato cheese. I love how filling it is and I love that every member of my family loves it across the board. The problem with Potato Cheese soup is that it is extremely high in calories. I don’t know about you but I enjoy things more when I do not have to feel guilty about eating it. This desire to eat without guilt motivated me to put a lower calorie spin on my favorite soup. I think I figured it out so please give it a try and let me know! In a large soup pot warm butter and oil. Add the onions, carrots, and celery. 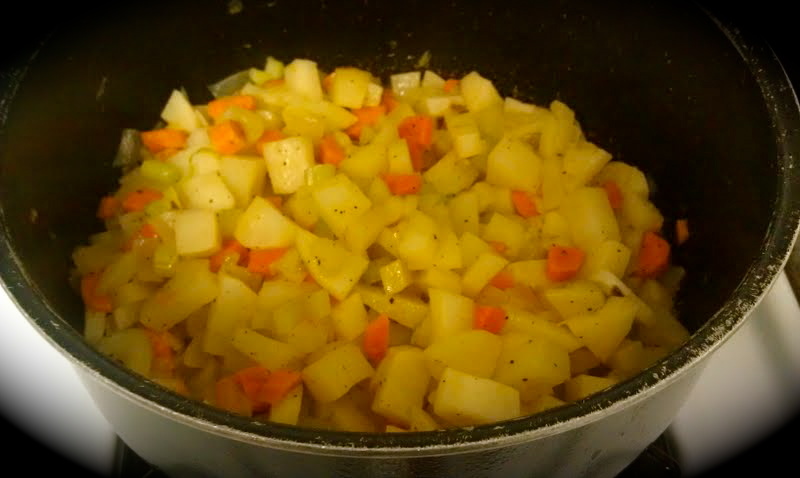 Cook veggies until tender and then add the diced potatoes. Add spices and cook covered on low for 10 minutes. Pour in the broth and bring it to a gentle boil, cooking 10 minutes, or until the potatoes are starting to get tender. Whisk together the flour and the milk and pour into the soup allowing soup to cook for another 5 minutes. 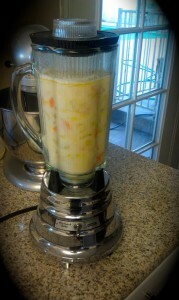 Remove half the soup and blend in a blender/food process until smooth (Be VERY careful here. The soup is extremely hot and it can cause the top of the blender to pop off splattering hot soup all over you. This may have happened to me before ;)…..) Pour it back into the soup pot and stir to combine. Stir in cream and grated cheddar cheese. Serve in bowls garnished with grated cheese and crisp bacon pieces. You probably will need to top with a little salt and pepper to taste. So why is this soup lower in calories?? Most potato cheese soups start with cooking the bacon in the soup pot first and reserving some of the bacon grease to cook the veggies. I just used a little bit of butter an olive oil. 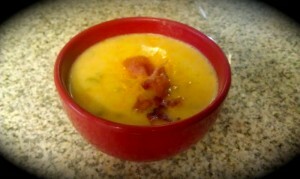 I still love bacon with this soup so I use it as a garnish instead. Most potato cheese soups call for at least 1 cup of heavy cream. 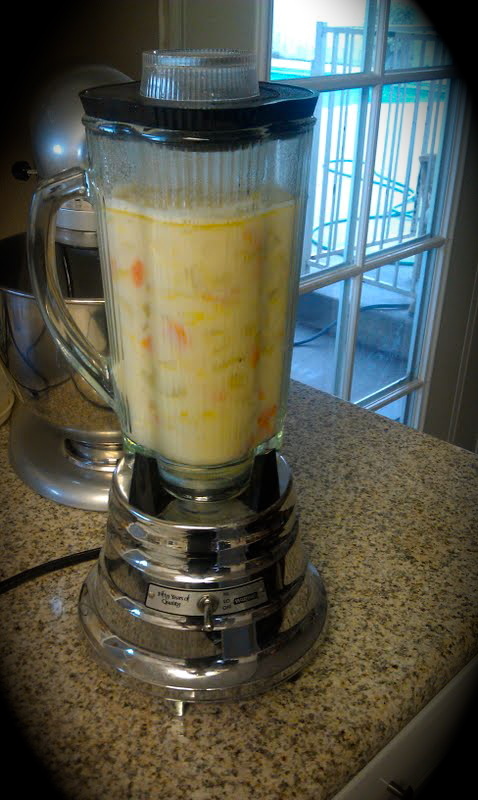 I use the blending the soup method, thickened milk, and a little bit of cream.